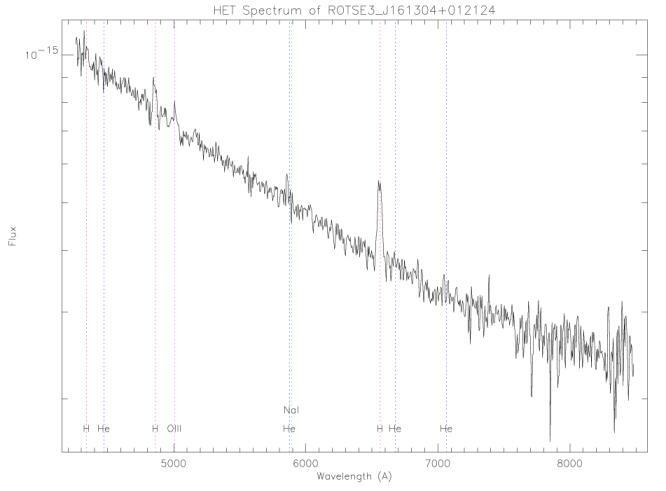 Rapid analysis of ROTSE-III sky patrol fields has revealed an interesting transient which we designate ROTSE3 J16134.4+012124.4. This object is absent in images taken until 12 April 2005, and is present in images from ROTSE-IIIb from 13 April 2005. It is currently around 18.0 magnitude at 15:00 UT on 13 April. 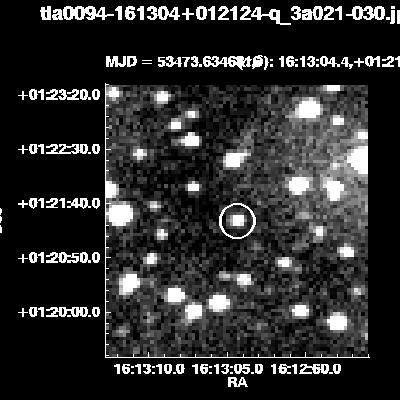 The object is in a small region not covered by the Sloan Digital Sky Survey, so we do not have quiescent colors. However, it is marginally detected in quiescence in one of the USNO plate scans, and is measured at R=20.4 magnitude in the USNO-B1.0 catalog. A spectrum (430-890 nm) obtained on Apr. 14.33 with the 9.2m Hobby*Eberly Telescope (+ Marcario Low-Resolution Spectrograph) by J. Caldwell and E. Terrazas shows a blue continuum with prominent H-alpha and H-beta emission. The spectrum has been flux calibrated. 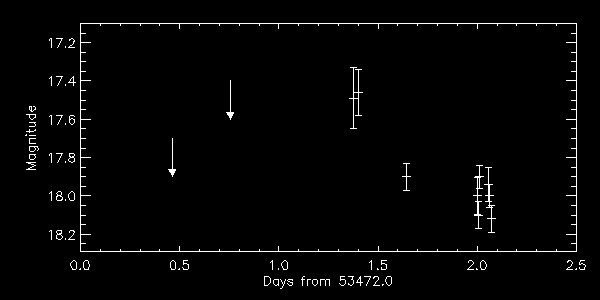 Spectrum of ROTSE3 J16134.4+012124.4 during outburst, from 14 April 2005. The object is very blue with prominent H-alpha and H-beta emission features. We are not sure of the identity of the other emission lines at the current time. From the spectrum we conclude that this is a galactic Cataclysmic Variable, although we are unsure of the type at this time.